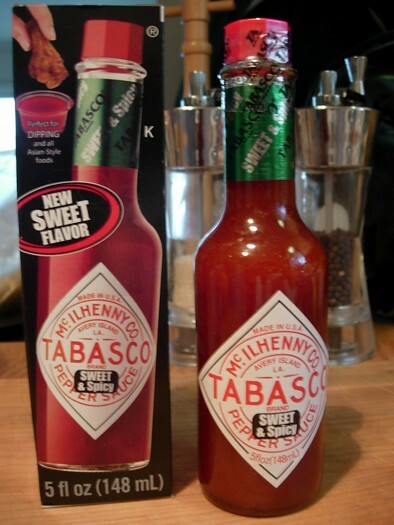 I’m really anxious to try Tabasco’s new Sweet & Spicy flavor of their first ever dipping sauce! It comes in their traditional bottle, but they are marketing it as their first dipping sauce for Asian-Style foods. DIP: Use straight from the bottle as a dip for chicken fingers, french fries, grilled shrimp, spring rolls, fried chicken, taquitos, vegetables and more. MIX: Mix TABASCO SWEET & Spicy Pepper Sauce with an equal amount of mustard to make a tasty mustard for hot dogs, hamburgers and sausage. Or brush it on baked or grilled ham or chicken as a glaze. QUICK FIX: Pour TABASCO SWEET & Spicy Pepper Sauce over a block of cream cheese. Use as a spread for crackers. New TABASCO SWEET & Spicy Pepper Sauce adds a sweet twist to many popular foods. It’s perfect for parties or snacking – a real crowd pleaser. Chipotle flavor Tabasco, which, and I love you Tabasco, but there are far better Chipotle flavored hot sauces out there. But that’s another post. You hold the very first pepper sauce from TABASCO brand that you can use as a dipping sauce, glaze or basting sauce and as a condiment. Ok… I can do that with all of your great pepper sauces too! TABASCO SWEET & Spicy Pepper Sauce is made by blending ginger and other favorite Asian flavors with TABASCO Pepper Sauce. So, try it when food calls for a little sweet heat. I’ve been waiting for this sauce to hit our market here on the East Coast, and it’s finally here. I’ll update this post soon, after I try the sauce. This sauce is sweeeet (high fructose corn syrup will do that). Very Asian influenced. Not good with tacos, burritos, etc. Tastes very much like a sweet chili garlic sauce that dozens of other mfgs. make, but with much less heat. It’s a great start for newbies into a sweet/hot chili sauce… heat is about a med-low to low. God Bless Ya, Tabasco… for trying. But I’ve yet to *really* love anything but your original Tabasco Sauce.